Sprout is a simple bot that demonstrates the Seed Token’s blockchain technology. 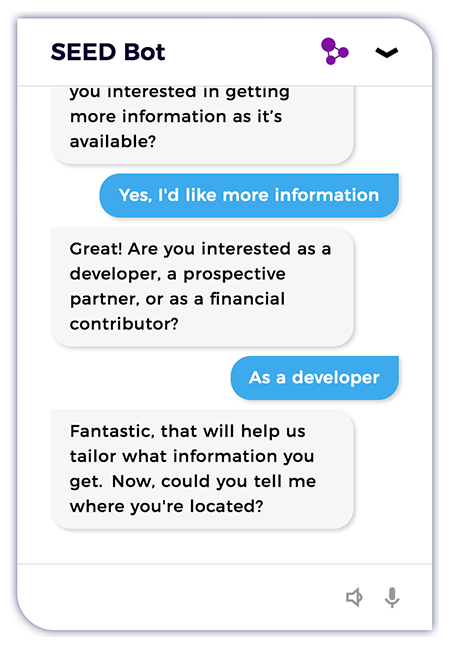 It asks and answers a few simple questions and logs the responses onto one of three transaction logs via the blockchain. Sprout has three code and service licenses on the blockchain. These represent the three licenses the SEED platform is designed to hold. When a user answers a specific question Sprout tracks it on the transaction logs accordingly. For example when an email address is entered there is a Per Use License transaction logged. When someone enters their location, the Subscription log is written to. It’s a simple yet foundational piece of working code. Important note: SEED will never write personal information to the blockchain. Can you provide more detail on the licenses? 1. Per use license. Any time code or services run, these transactions are logged onto the blockchain so that the license can be compensated for each use. 2. Free license (freeware). In this case, there is no charge for using code or services, but Sprout logs these transactions anyway, so we can track traffic and generate analytics about what is used on the platform. 3. 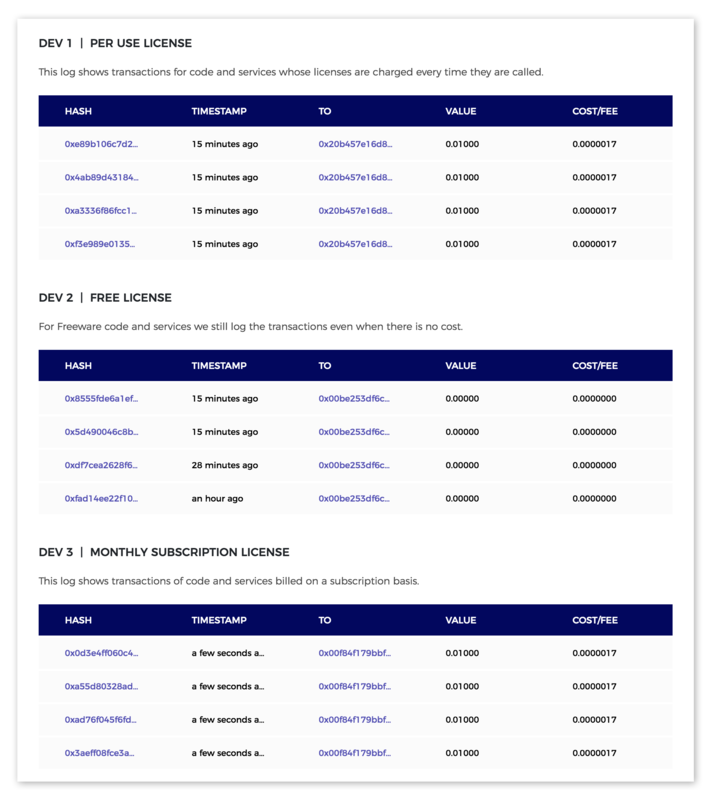 Subscription license. Sprout compensates the license-holder at the first use, while all transactions are logged. This specific subscription is a monthly one, but subscriptions can be set for any length of time. What do the transaction logs mean? The transaction logs show the specific licenses being compensated on the blockchain. SEED writes to the blockchain when the bot interacts with end users. This transaction log shows the per use, free and subscription licenses being written to the blockchain. From a tech standpoint, Sprout represents the first time a bot is running on a blockchain and logging transactions. When a specific code or service runs, it makes an entry on the transaction log. Then, according to the license terms, it compensates the owner. The log shows us that it’s working. You can click on the transaction and it takes you to the Ether explorer, which allows you to see the transactions. Like most blockchain projects, transparency is built in. When everyone on the platform can see the transactions that helps generate trust. Why is Sprout a milestone for SEED? Sprout is our demonstration that the core technology works: a bot logging transactions on a blockchain. The number of bots is going to explode. By putting them onto our platform we’re enabling transparency and accountability around their use, which doesn’t exist right now. For example, there is little to no transparency around the accounts on Facebook and Twitter. We have to trust these companies to identify and label bot accounts. We have already seen how conversations, transactions, and even elections can go wrong when bots aren’t identified or accountable. The Sprout demo shows just a glimpse of what will grow into an active community of buyers and sellers of bots, services, and components through these licenses. We’re continuing to build our technology — including bot stores and other media that are authenticated and compensate their creators. Our simple Sprout demonstration is just the first step of the exponential growth of a viable, vibrant bot economy.